Build Your Own Blog Network in Minutes! 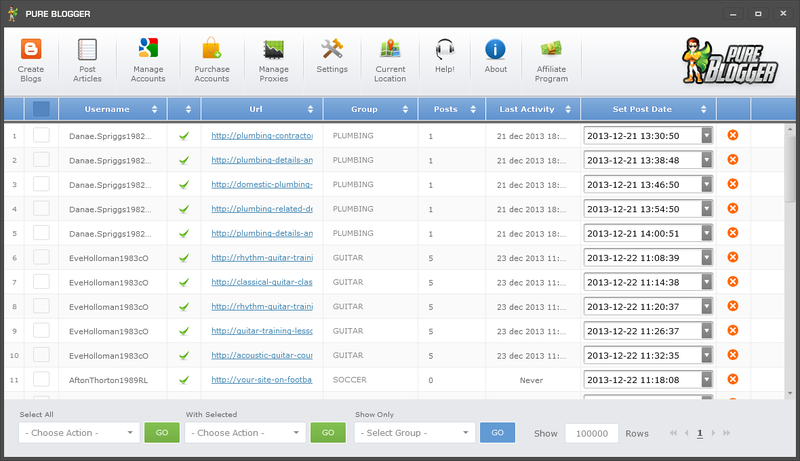 Finally a Software that Manages All Your Blogspot Blogs at One Place! What’s The Best Tool To Use In Order To Reach Top Positions in Google? Is it Facebook, Twitter, Pinterest, WordPress or A Product Made By Google Themselves? Well I guess The Answer Speaks For Itself...Google's BlogSpot Blog Network Is The Best Choice In Order For You To Get Reach The Top Positions in Google! Therefore We're Extremely Proud To Announce Pure Blogger, A Comprehensive Blogspot Account Manager Software, That Will Help You Reach The Top Positions You've Only Dreamt About Before! PURE BLOGGER Automatically creates new Blogspot Blog account(s) for you, simply provide your Google account(s) login credential(s) and you’re ready to Rock! 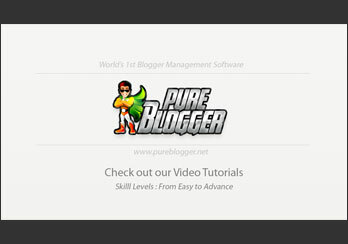 PURE BLOGGER allows you to post to unlimited Blogspot Blogs at the same time or individually. You can schedule new posts to be posted at a later date on any or all of the blogs! Keep Control of all your Blogspot Blogs inside PURE BLOGGER via the Global Overview showing your Blogspot blogs stats such as: Title, URL, Total nr of Posts/Pages and Last Activity. No Matter If You Are Promoting Own Websites in different Niches OR if you’re A SEO Company for Many Clients You Can Assign Blogspot Blogs To Groups. Once Setup, simply Choose a Group you want to Promote by selecting it in a dropdown. Perhaps you want to save a great Blogspot post for later use? No problem, by using the Template System in PURE BLOGGER you can save as many templates as you want and import them with a single mouse-click! Use Spinned Content for Posts, Pages, Subdomains, Tags In Order To Get Unique Content on each Blogspot blog. Built-in Support for The Best Spinner and ArticleBuilder. PURE BLOGGER Allows you to create up to 5 Blogspot blogs per Google account. These accounts will be created on autopilot using Smart Algorithm and Scheduling to prevent your account from being closed. If you have several Blogspot blogs that are in different niches PURE BLOGGER allows you to set a group name for each niche. This is also very useful if you are doing SEO for other clients as you’ll be able to show only this clients blogs! Get Pure Blogger News & Updates! Copyright © 2014 Pure Blogger. All Rights Reserved.